Window of All RSI is purely based on RSI. The idea for this indicator is for those traders who believe in to trade according to RSI. 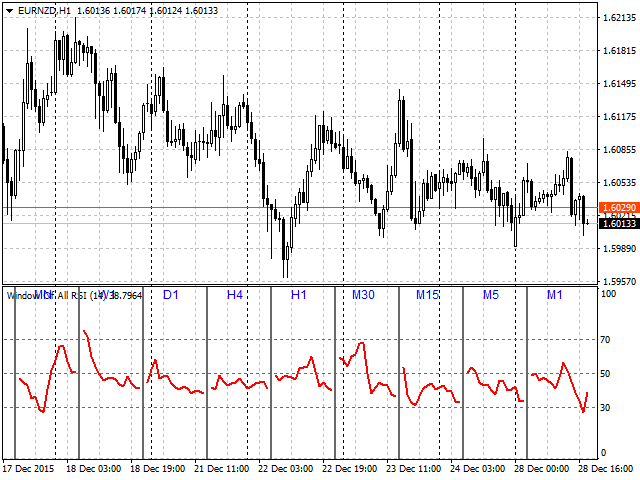 This is a multi timeframe task of Relative Strength Indicator (RSI). It gives you the ability to see the RSI levels of all timeframes in one separate window. The main reason of this indicator is to provide all mapping of RSI levels in one chart. A user can easily trade if he/she wants to trade by RSI levels. For example: Buy or Sell at time of extreme oversold/overbought levels by watching different timeframe levels in one chart.